As many as 75,000 miners, or 15% of the sector's workers in South Africa, are now on wildcat strikes after around 300 employees at Kumba Iron Ore's Sishen mine downed tools on Wednesday. On top of the mining strikes – which are concentrated in the platinum and gold sectors – truck drivers across the African nation have also started labour action which is putting pressure on fuel suppliers. Kumba was regarded as immune to the strike contagion because rank and file employees there in December who had worked for at least 5 years were given a lump sum of about 345,000 rand [$41,000]each after taxes as part of a share scheme. This represented a fortune to workers earning as little as 7,000 rand [$830] a month. But it was not immediately clear if any of the 300 reported strikers were among the 6,200 who had benefited from the plan. News24 reports on Wednesday a guard was killed at a coal mine in the province of KwaZulu-Natal, bringing the death toll in the the labour unrest to some 50 people. 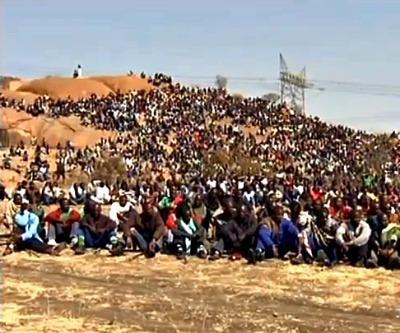 The ongoing illegal strikes were prompted by the killing of 34 people at the hands of security forces at the Marikana platinum mine in August. The owners of the mine, Lonmin, eventually gave in to a 22% pay increase, prompting workers at world number one platinum producer Amplats, gold giants Anglogold Ashanti and Gold Fields to make similar wage demands. Harmony Gold had been spared the unrest, but workers at the company's mine in the Gauteng province have now joined protests. Globally South Africa is the fourth largest producer of iron ore, holds the same rank for annual gold production, is the number one in platinum output and holds fifth spot for steam coal. The price of iron ore was unchanged at $104.20 a tonne on Wednesday having clawed back more than 20% of its value since hitting a three-and-a-half year low of $86.70 on September 5. This time last year the commodity was trading at $170 a tonne.